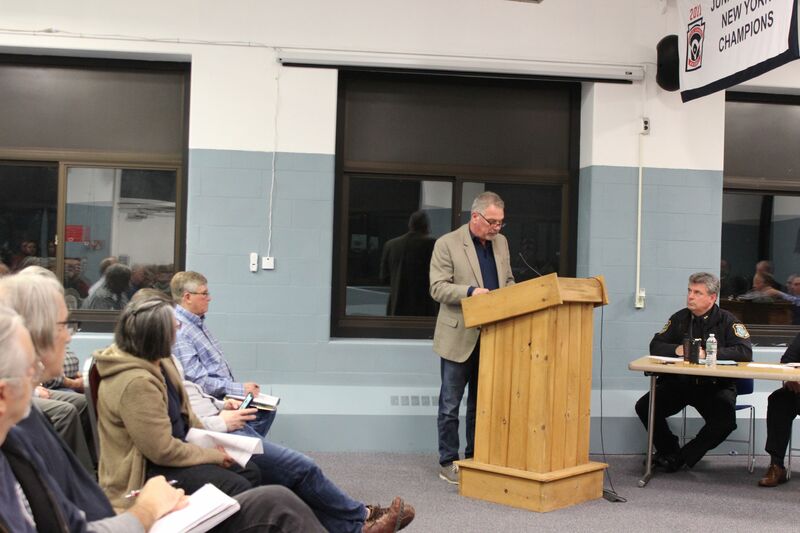 The Town Board of Stony Point approved a proposed “overlay incentive district” intended to make it possible to profitably market the 25-acres surrounding the Town of Stony Point’s golf course on Tuesday, April 9. The move appeared to have general approval from dozens of residents gathered at the meeting for the third session of a public hearing on the issue. The overlay district will allow for zoning changes for a developer who may want to put a hotel/conference center at the site or make other changes that would bring rateables to the town. Most of the members of the audience did not want to see more housing built, but rather income-generating endeavors that would help offset their taxes and free up money to fund needed infrastructure improvements. In approving the overlay incentive district, the board made it clear the RHO building, Kirkbride Hall and the former Letchworth building that houses the town’s Justice Court would be rehabbed, and a new senior center would be built by any developer who comes in to purchase the property, which has been on the market for 20 years. Rehabilitating the former Letchworth Village property has been a challenge for the town to get any developer interested in its purchase, since it requires heavy-duty remediation. The buildings, all connected by an underground tunnel, house the electricity for the buildings and those wires are covered with asbestos; many of the buildings contain asbestos as well, and past plans to renovate them and turn them into condos was shot down due to asbestos and other contaminants (i.e., lead paint) in the buildings. Currently, Patriot Hills, LLC is looking at the golf course and the surrounding property and would like to purchase it if it can work out a plan to make it economically feasible for them and to see a return on its major investment. It will be hosting a public meeting for residents to attend and ask questions on Wednesday, April 17 from 7 – 9 p.m. at the Clubhouse at Patriot Hills. SPACE (Stony Point Action Committee for the Environment) President George Potanovic, Jr. agreed the overlay district could benefit the town but asked the board to take a step back before approving the zoning changes. Town Historian Susan Filguaras said even though Letchworth Village is now somewhat infamous for substandard conditions in the 1970s due to lack of funding, it should be remembered “for the good, the bad and the ugly” part of Stony Point’s history it played. It employed thousands of people during the many years it was home to 4,000 residents and in operation. When it was first conceived the village represented a great advance in the treatment of the developmentally disabled. Supervisor Jim Monaghan and council members agreed on the public’s concern about the golf course being turned into a housing development, saying Patriot Hills is not going to be turned into housing, as the Minisceongo Golf Course in the Town of Ramapo, which is being proposed by the buyer of that course. The meeting on April 17 will give townsfolk the opportunity to get questions answered by the proposed buyer, Patriot Hills, LLC.